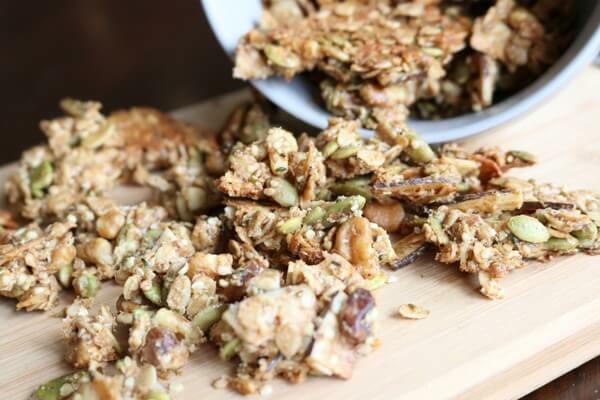 Granola is the perfect pantry staple for a busy family. 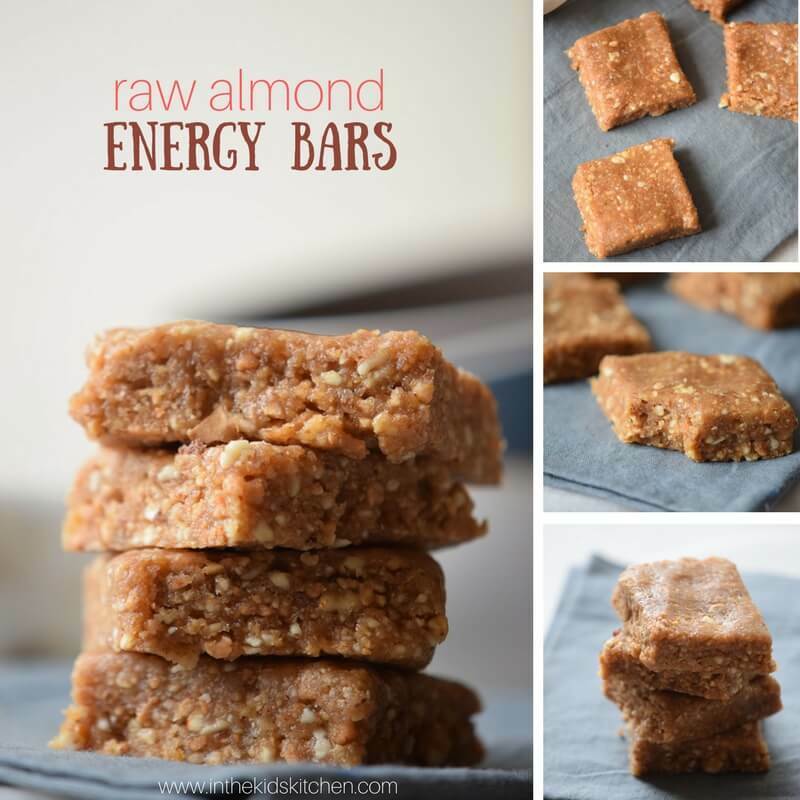 It works on top of yogurt, smoothie bowls, all by itself in a handful or made into bars like this. 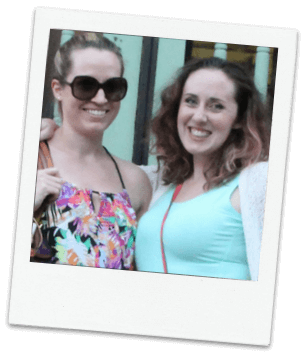 Many store-bought brands contain artificial sweeteners or additives, so we make our own healthy, naturally-sweetened homemade crunchy granola! 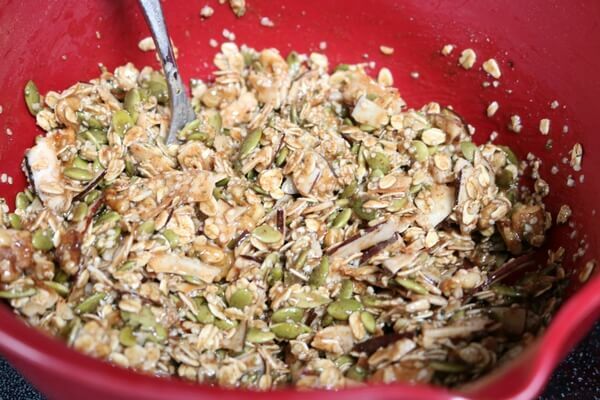 This crunchy granola recipe is perfect when added to just about anything. However, my personal favorite is to eat it in place of cereal in a bowl with some almond milk. The presence of both maple and cinnamon give it a sweet taste and truthfully, you’ll be hard pressed not to eat the whole batch! The large, toasted coconut help balance the fat ratio providing some healthy saturated fats but also give it the crunchy texture I love. 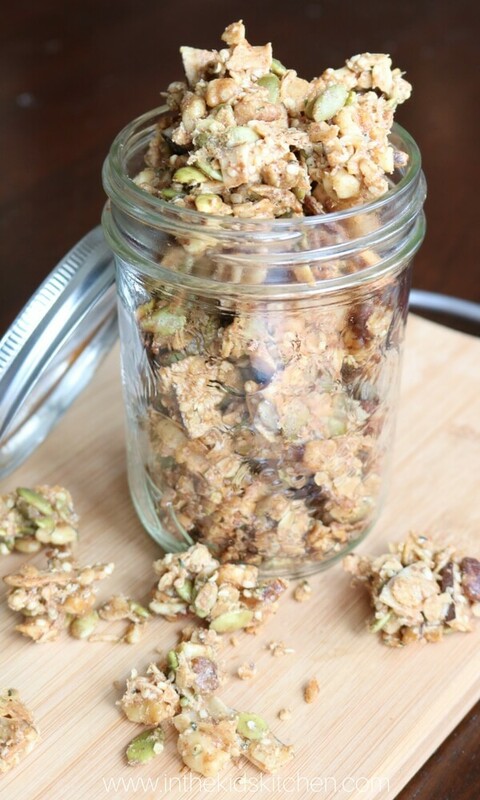 The wet ingredients both make this granola sweet as well as bind it together making it so unless you break it apart you end up with fun tasty little granola clusters! All in all, this granola is the perfect addition to an oatmeal breakfast, a great yogurt topper, and even better by the handful snuck out of the fridge! Tip: Make sure you use shaved toasted coconut and not shredded. Not only does it enhance the flavor but it helps it all stick together. Add dry ingredients to a large mixing bowl and stir to combine. Add wet ingredients to a small saucepan and heat on low (if you place the stove too hot the almond butter will burn). Whisk frequently until all wet ingredients are smoothly combined. Pour the wet mixture into the bowl of dry and mix everything is coated and semi sticky- try not to eat it all here! 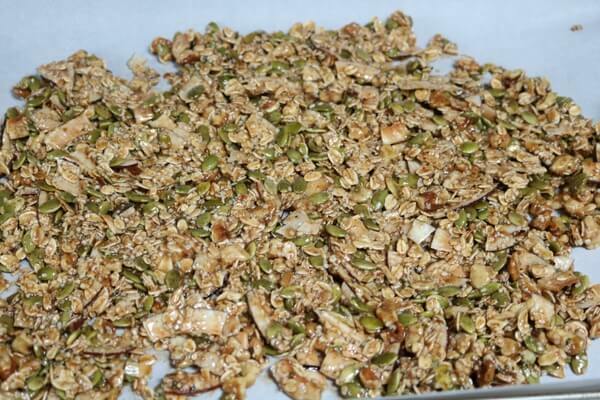 Line a pan with parchment paper and spread granola mixture evenly over the pan. 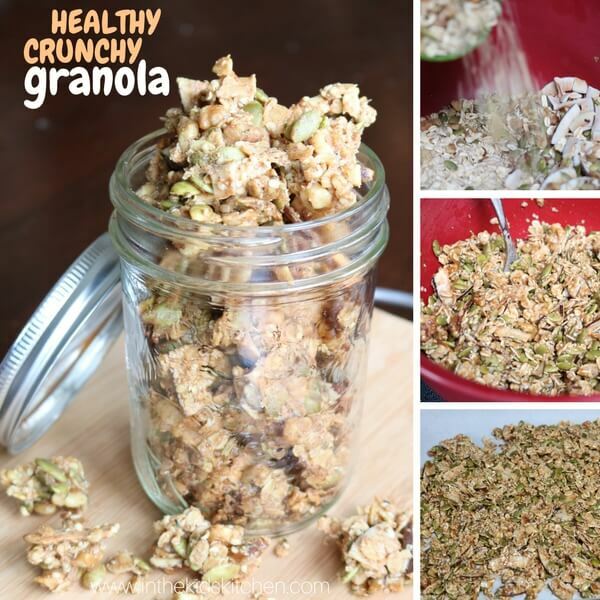 Try to keep the granola together and not spread apart but keep the layer thin. Bake for 12 minutes. Remove from the oven and stir placing the granola back into a single layer. Bake another 10-12 minutes keeping watch carefully in the last two minutes. You want the granola to be just starting to brown. (Any longer and you’ll risk it burning). Remove the pan from the oven and let sit on the counter for one hour. The granola will harden as it sits. 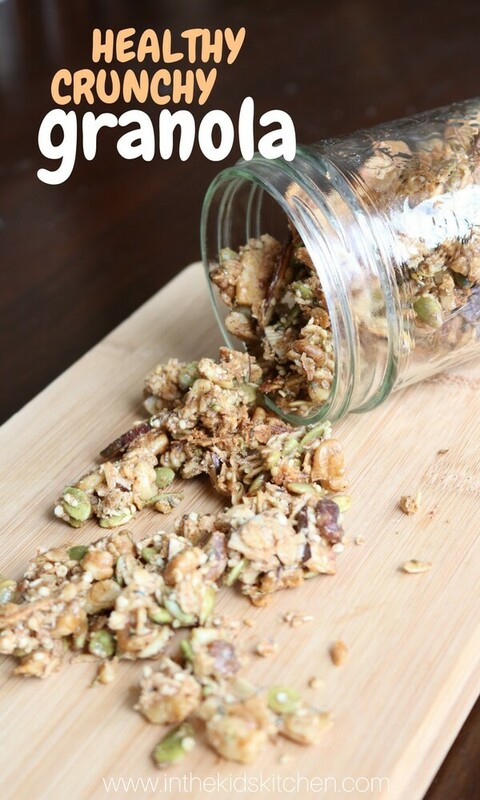 After an hour, break granola apart as much as preferred and store in mason jars in the fridge. In a large bowl combine the dry ingredients and mix. In a small pot combine the wet ingredients and heat on low (if you place the stove too hot the almond butter will burn). Whisk frequently until all wet ingredients are combined. Pour the wet mixture into the bowl of dry and mix well until everything is coated and semi sticky- try not to eat it all here!. Bake for 12 minutes. Remove from the over and stir placing the granola back into a single layer. Bake another 10-12 minutes keeping watch carefully in the last two minutes. You want the granola to be just starting to brown. Any longer and it will burn. Remove the pan from the oven and let sit on the counter for one hour. The granola will harden as it sits. If you’re looking for something sweet, crunchy and full of healthy ingredients this homemade crunchy granola is perfect for you! It makes a great addition to smoothie bowls but it’s also great all by itself or packed into a bag for snacks on the go.